Most, if not all, of these producers believe they can simply ignore existing labor contracts and be free of the unions’ grasp. Many of the actors and crew believe they don’t have to pay their mandatory union dues. In fact, both of these positions are dangerously inaccurate. In a “right-to-work” state, the laws and regulations don’t prohibit unions. They just make sure that membership in a union isn’t a condition to employment. Put simply, a worker in a “right to work” state doesn’t have to join a union and pay dues to get a job. (As an aside, these laws were passed as part of Roosevelt’s New Deal and were, for the most part, intended to combat what was seen at the time as coercive, over-powered unions.) Despite some producers and workers beliefs, unions still exist in “right to work” states. Members still pay dues. Binding contracts are still signed. Contracts are still enforced. In fact, some of the fastest growing industry unions are operating in “right to work” states. This is the case, because unions have enjoyed a long history and deep penetration in the entertainment industry. Indeed, nearly all of the talent and craftspeople necessary for modern productions are members of a union or guild. This includes everyone from actors to producer to DP’s to costumers. Indeed, the most talented and experienced contributors are likely long-time union members themselves. It follows then, that aspiring members of these communities would want to be part of these organizations of their peers. Why would we believe any of this changes in a “right to work” state? A contract is still a contract, and an agreement is still an agreement. A union member must still pay her contractually mandated dues. A union member hired on a non-union set doesn’t magically lose her union status. And while it might be true that in a “right to work” state students just out of school, hired as PAs or video assistants, would not be required to join a union – most welcome the chance to join. And as more productions move to these states, the unions will grow their membership at a commensurate pace. The benefits to new members generally far outweigh the drawbacks – health insurance and retirement contributions chief among them. For years, producers believed they could avoid the entertainment unions by producing in “right to work” states and hiring non-union employees. Such has never been the case – despite their beliefs. In the first place, experienced “above the line” talent (actors, writers, and directors) that producer want in their projects are already union members and will not work in a non-union production. (There are exceptions, but they are few and far between, given the strict rules against working in a non-guild/union production.) Second, the “below-the-line” crafts, the camerapersons, editors, electricians, grips, etc., have been intensively organized by their very active industry union, the IATSE. If a union’s members represent a majority of the producer’s employees, or if the union organizes them into membership, there is nothing in a “right to work” law that prohibits the union from demanding recognition and union contracts, and, this is the important part, striking if they feel they are being treated unfairly. In my experience, most reputable producers have figured this out, which is why the vast majority of productions in these states are under union and guild contracts. Bottom line, moving your production to a “right to work” state, for the sole benefit of avoiding unions and guilds, will not have a significant effect on your productions. Talent and crews in these locations (particularly Atlanta) are already union members, and you’ll be hard pressed to find folks who won’t require union or guild contracts. Indeed, producers attempting to go completely non-union may actually find themselves in the middle of an organizing campaign with many of its employees jumping at the chance to join and get that coveted guild or union card – to say nothing of decent health insurance and retirement. 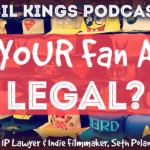 PENCIL KINGS INTERVIEW – IS FAN ART ILLEGAL? My Pencil Kings interview is up. 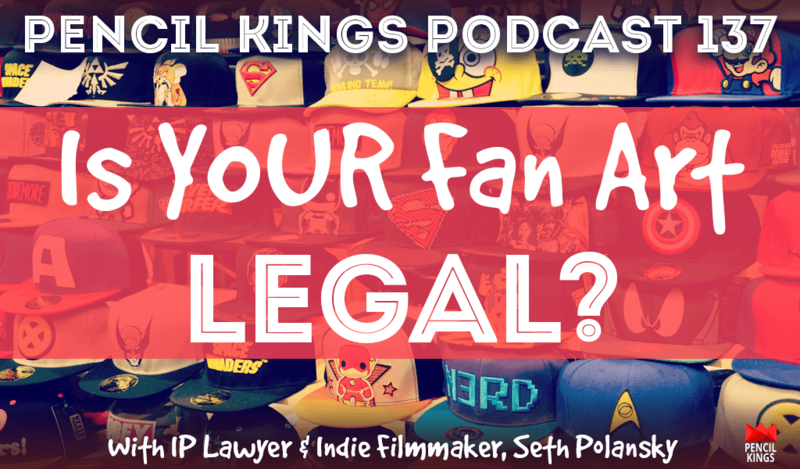 You can listen here!